And priceless is, like you, very dear! What a pity it's not seen A bit more in between! And look upon my problems as your own. You share my every dream and add to my esteem. You help me and do favors, big and small. Mother, you're my dearest friend of all. until the children are in bed. A suburban mother's role is to deliver children obstetrically once, and by car for ever after. Can take the place of you, dear mother. And with love, you filled an empty need. of comfort, happiness and being. I can’t remember being born. And that's what Mothers were created for. And contented happiness for you. And your cuddles were divine. I’m so proud to share your name. Yes, and all the way back again! Just how do you think I'd look? My sweet, lovely mother...that was you! Then thanks for all you’ve done and do. And that we love and honor you. You who are more than a Mother to me. Mother, you taught me religion . "You better pray that will come out of the sheet." “I'm going to knock you into the middle of next week!" "Put your sweater on; I know you’re cold?" That’s when you taught me ESP.
" Because I said so, that's what’s for"
You’re not going to the store"
You taught me about the science of osmosis. "Shut your mouth and eat your tea"
Who I love very much...that’s who! In a small child's offering. 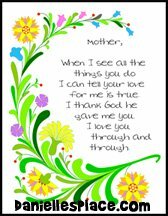 (England) I wrote it for a mothers day card for my sisters, but it can easily be used for different occasions. (County Durham UK) My daughter asked me to make a card for her to send to her best friend as she had the unenviable task to have her Mother looked after in a Nursing home as she has to have 24-7 care and could not do the job herself. This had broken her heart but nothing on the Net came close to the words I wanted to have in the verse.